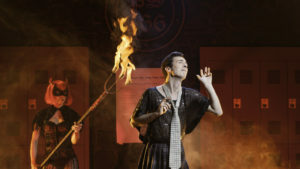 The immensely gifted Sean Patrick Monahan is Desmond Channing, a demented teenager with delusions of grandeur, in his new musical, Diva: Live from Hell, a dark comedic sendup of madness directed with smart intensity by Daniel Goldstein at Theater for the New City’s Community Space through April 9th. Monahan also wrote the book and plays all the characters in Diva with more than serviceable music and lyrics by Alexander Sage Oyen. One ballad concerning unrequited love is excellent. Musical accompaniment is a nifty trio of Sammy Wags (drums), Rob Taylor (double bass), and Evan Tylor (piano and sound mixer). 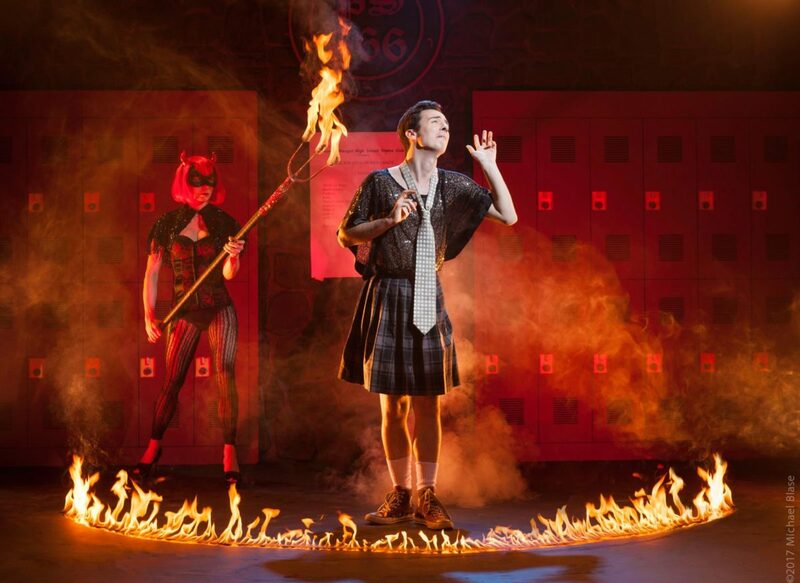 The clever musical takes place at a cabaret in Hell called the Seventh Circle, where Desmond is forced to relive his twisted tale night after night as punishment for his sins. Desmond Channing’s story chronicles the rapid descent into madness of a teenager who has spent his short life in the limelight. Set at a public high school in an unnamed town in Florida, where the power-hungry Desmond has recently been elected President of the Drama Club after previously starring in all the school’s musical productions, the story follows the teenager’s mental deterioration, which is triggered by the arrival of Evan Harris, a likeable transfer student from New York City, who just happens to be a talented up and coming professional, everything Desmond longs to become. When the threatened teenager retaliates with unrelenting attempts to sabotage the new comer by any means possible, Desmond’s hysterical reactions to Evan crescendo into an ultimate act of violence in his surrealistic fall from grace. Monahan moves seamlessly from one character to the next physically and emotionally embodying each one with consummate flair. His voice is terrific, and when he launches into song his brave performance and Diva comes fully alive. Unfortunately, although initially witty, Desmond, who comes across as a crazed drag queen, is such a shallow lout that you quickly lose all compassion for him. Despite all the talent involved his story ceases to amuse and you couldn’t care less. Sort of like Donald Trump, another man/child, Diva from Hell. Shrewd yes, but enough already! Produced by Jenna Grossano, Diva: Live From Hell features choreography by Jennifer Jancuska, Set Design by Daniel Geggatt & Caitlyn Murphy, Costume Design by Tilly Grimes, Sound Design by Tyler Kieffer and Lighting Design by Paige Seber, and musical direction by Luke McGinnis. Remaining performances of Diva: Live from Hell are on Friday, March 31 at 8pm; Saturday April 1 at 8pm; Sunday April 2 at 8pm; Wednesday, April 5 at 8pm; Thursday April 6 at 8pm; Friday April 7 at 8pm; Saturday April 8 at 8pm; Sunday April 9 at 3pm. Tickets are $18 and available online at www.theaterforthenewcity.net or by phone (212) 254-1109. Theater for the New City is located at 155 1st Avenue (btw 9th and 10th streets) in Manhattan.